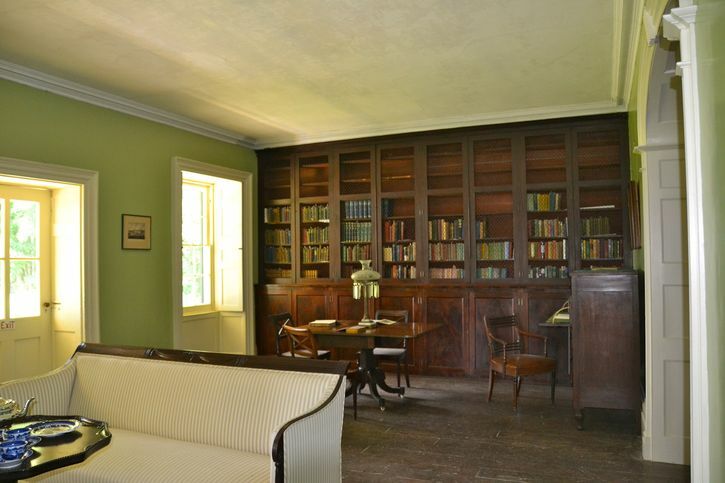 Hyde Hall is one of the finest representations of romantic classicism in America. The three parts of the house-the family rooms, the guest or entertaining areas and the staff quarters-were built in three different styles around a central courtyard. The first part, called the Stone House, was built for family life and is Palladian in form with a central two story, hip roofed core flanked by one story wings and fronted by a porch. The architectural details include Tuscan piers on the porch, a Palladian window surmounted by an oval arch, five oval windows and simple moldings in a restrained Federal style. The walls are smooth ashlar limestone with a narrow intervening band for every third course. 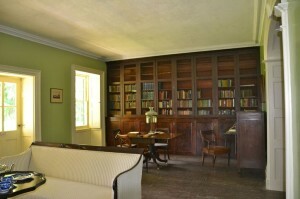 The interior rooms are intimate, focused around a pair of library-living rooms. The second part constructed is composed of extensive service quarters and second-floor bedrooms. It is larger than the Stone House, but simpler in detail and finished on the exterior in fieldstone. The third part to be built, called the Great House, is in yet another style. There is hardly a curve to be seen, all the moldings are square with incised rectangular panels around the windows and entrance doorway. The Greek Doric columns, one of the first uses of the Greek order in New York, are more slender than any known Greek prototype. The walls are smooth ashlar blocks of larger scale and without differentiation in the courses as found on the Stone House, containing two grand entertaining rooms, a Drawing Room and a Dining Room, both 34 by 26 feet with decorative 19 foot ceilings. A semi-circular staircase leads to the Billiard Room in the attic pavilion. Click the links below to learn more about Hyde Hall’s Architecture.